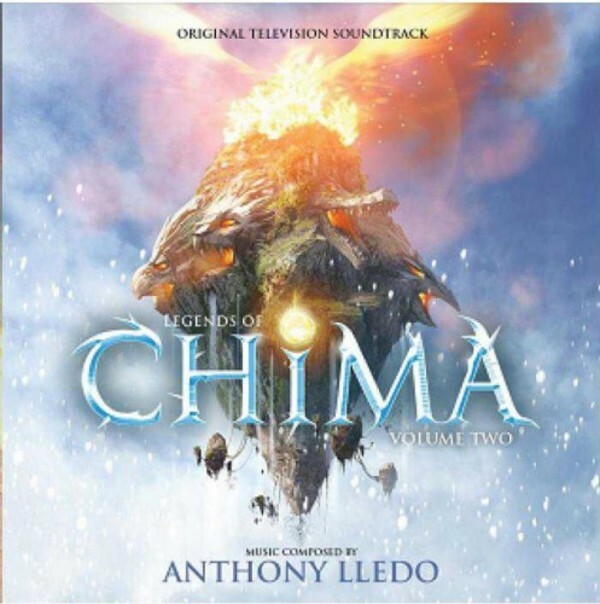 MovieScore Media returns to the wonderful land of Chima with Volume 2 of Anthony Lledo’s epic score for Legends of Chima, the animated adventure series based on the hit Lego toyline of the same name. The Cartoon Network show takes place in Chima, a magical land filled by tribes of anthropomorphic animals (such as Eagles, Lions, Bears, Gorillas, Rhinos, Crocodiles, Wolves, Ravens, Skunks, Beavers, Foxes). Volume 2 follows the tribes’ adventures with music from Season 2 (Quest for the Legend Beasts) and Season 3 (Legend of the Fire Chi). Just like in the case of Season 1, the music is recorded by the F.A.M.E. 's orchestra in Skopje, Macedonia while the woodwinds are recorded in Los Angeles. Danish composer Anthony Lledo made his grand entrance into the world of film scoring with the orchestral score to the Swedish thriller 'Frostbite' (2006). In 2008, Anthony moved to Los Angeles by invitation from film composer Harry Gregson-Williams and he contributed to such major motion pictures as 'X Men Origins: Wolverine' (2009), 'Prince of Persia: The Sands of Time' (2010) and 'Unstoppable' (2010). Anthony also scored the four time Emmy Award winning Civil War film 'Gettysburg' (2011), the powerful historical documentary produced by Ridley and Tony Scott, as well as the horror/thriller 'Darkroom' (2013). The Legends of Chima scores are a direct continuation of the composer’s long-time association with Lego, M2 Film and director Peder Pedersen, for whom he adapted classic John Williams themes for Lego Indiana Jones: Raiders of the Lost Brick (2008), Lego Star Wars: The Quest for R2D2 (2009) and Star Wars: Bombad Bounty (2010), all helmed by Legends of Chima co-director Pedersen. Apart from the previous volume of Legends of Chima , which won the 2013 Cue Award in the category of 'Best Score for Television', MovieScore Media has also released the chilling Frostbite score by the composer. Volume 2 presents brand new musical themes for the new tribes, locations and characters introduced in the Second and Third seasons of the show. Among the new tribes are The Dark Tribes living in the jungle and foggy swamps of The Outlands, The Ancient Hunters, an ancient race of animals from the Ice Age awoken from thousands of years of being frozen in the ice below Chima now marching forward to freeze all of Chima, the mighty Phoenix, the ancient highly spiritual and powerful creatures of Chima, the mysterious Lavertus and the Phoenix' most powerful and trusted advisor Tormak the Tiger. The new, adventurous arrangement of Laval the Lion's theme heard in the opening 'Return of The Heroes' marks the return of old favourites from Volume 1 as well.